Pier 39, Fisherman’s Wharf, the Ghirardelli Chocolate Factory, views of the Golden Gate Bridge and Alcatraz: these are typical tourist destinations in San Francisco. Those of us who travel a lot like to see ourselves as something other than tourists. Some use the term “traveler,” or “visitor,” for example. We avoid like the plague any destination that is purposely set up to earn money from tourists, especially if there are crowds of them. Nevertheless, I spent a day recently at some of these typical tourist destinations and, surprisingly, enjoyed myself tremendously. I started at the Ferry Building: the least touristy sight of the day. It has been turned into a very upscale foodie mecca, and looked to be frequented by locals as well as tourists. I’ve never seen so much chic food in one place, though the line for coffee was longer than for any of the other shops. It must be very good coffee! I strolled along the palm tree-lined street past a series of pier buildings: some being used for parking lots, some converted to other purposes, such as the Exploratorium (which I’d certainly recommend if you have kids) and the terminal for the ferry to Alcatraz. Speaking of Alcatraz, it was visible between the buildings, as was the Bay Bridge and Treasure Island. 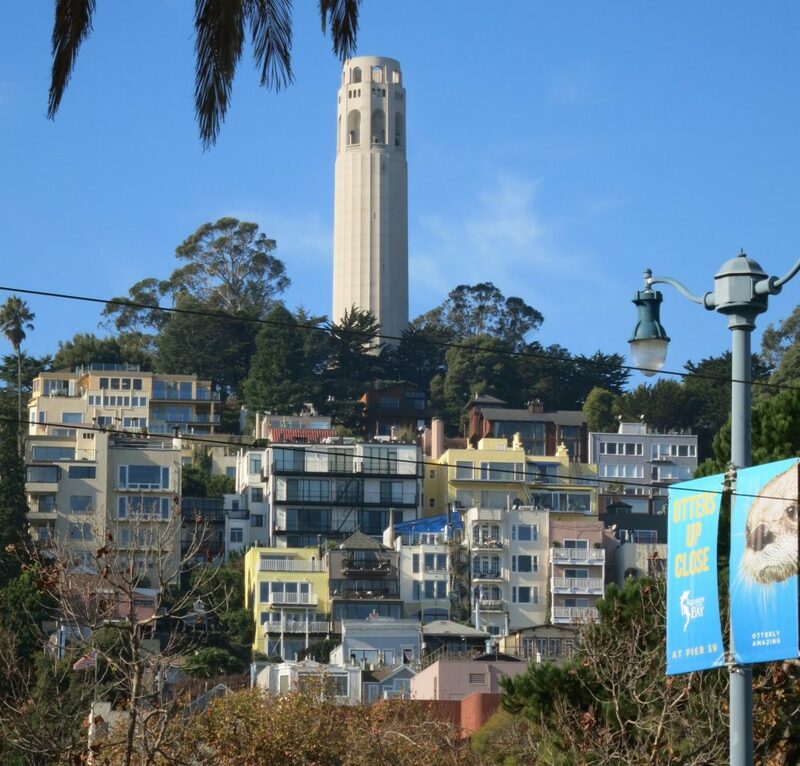 Looking inland, I could admire a stunning view of Telegraph Hill with its clusters of houses, topped by Coit Tower. Further along, the Golden Gate Bridge became visible as well. 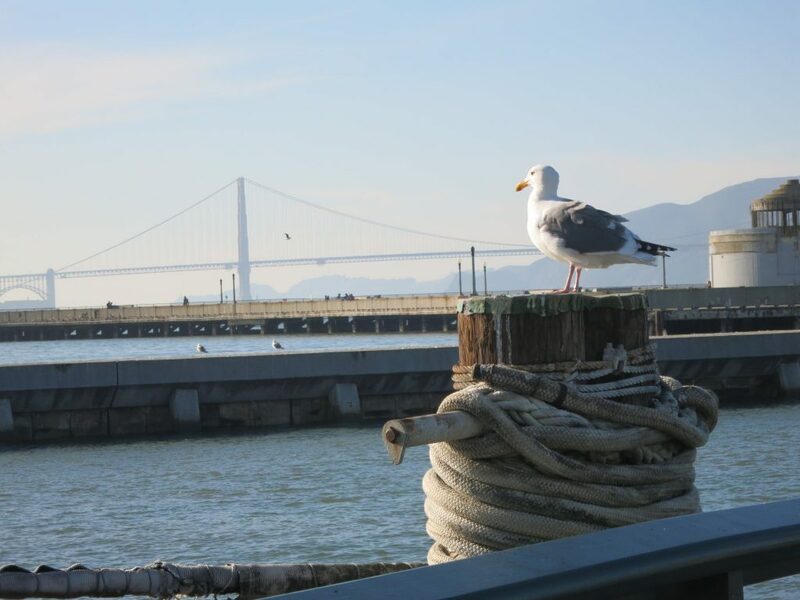 Pier 39 is a standard tourist destination. It has been converted to a shopping center, with a host of specialty stores and restaurants, often related to San Francisco in some way. There are souvenirs galore, of course, and restaurants, and attractions such as a small aquarium. I would normally never go there. It’s for tourists, it’s overpriced, and it has no real relationship to San Francisco as the locals see it. I prefer to explore “the real San Francisco,” whatever that means. Yet I enjoyed wandering the length of the pier. It was clean and bright and the couples and families around me (the “real” tourists) were enjoying themselves. What’s not to like? There was no one forcing me to spend money, and soaking in the generally happy atmosphere was free. I continued my walk along the waterfront and soon reached Fishermen’s Wharf, lined with restaurants and shops vying for the tourists’ attention. Judging by the Dungeness crabs and other seafood on display, as well as the generally fishy smell of the place, there’s plenty of fresh seafood available, even if few fishermen sail from here anymore (There is charter fishing available, though.). I didn’t stop to eat, but I suspect you can get perfectly good, if overpriced, meals there. 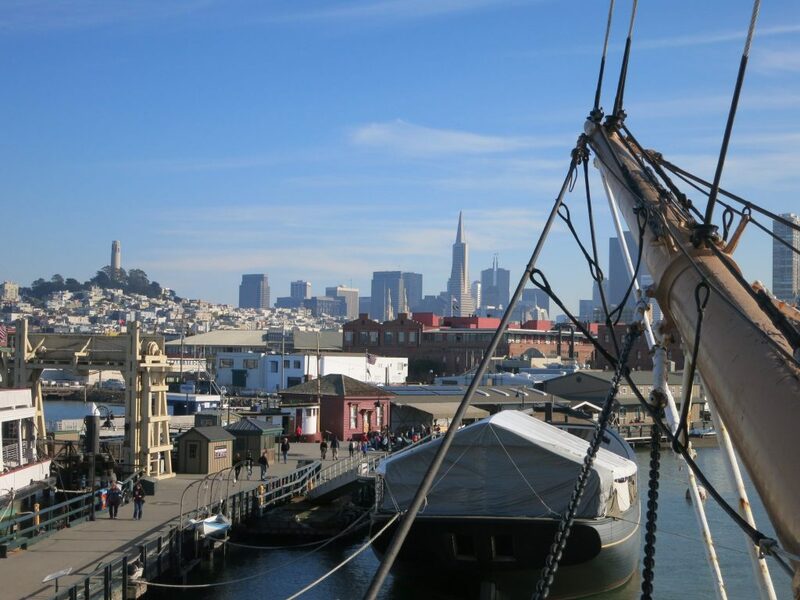 Just past Fisherman’s Wharf is the San Francisco Maritime National Historical Park, where you can walk along the old Hyde Street pier for free and admire the restored boats on display. For a small fee ($5), you can board some of them to have a closer look. I particularly loved exploring the square-rigger Balclutha, and the views from up on its deck were breathtaking: the city skyline, the Golden Gate Bridge, and Alcatraz. I didn’t have time, but there are other maritime history sights to see: a Maritime Museum (free admission!) was built as a bathhouse in 1939 and is decorated with WPA murals. And at Pier 45 you can visit two vessels from World War II: a liberty ship and a submarine. Sometimes I think I spend too much time trying to differentiate myself from the tourist hordes. After all, there’s nothing wrong with being a tourist, is there? 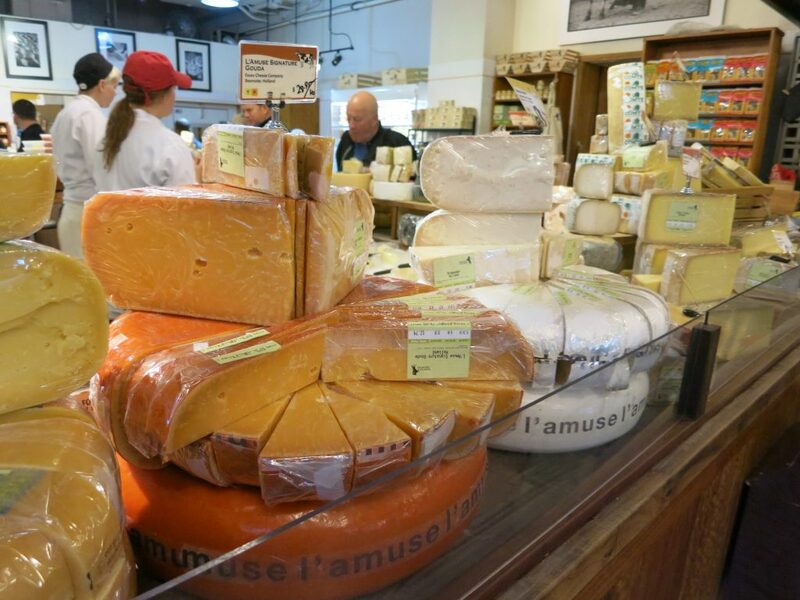 Tourist destinations become tourist destinations for a reason: there’s something there that’s interesting or entertaining. Why avoid them? Join the tourist crowds and enjoy! Lovely post! When I was in San Francisco, I really enjoyed touring the Ghirardelli Chocolate Factory and hiring a charter boat for a sail in the Bay. Such a beautiful city!